Most kapa was made from the inner bark of the wauke plant (paper mulberry) because it made soft, white kapa. The bark is stripped, soaked, and then compressed into sheets with special patterned wooden beaters and finally dyed and decorated. To make kapa, Hawaiian women used wooden mallets to pound the strips of bark together to form sheets of various sizes, textures, and thicknesses. The top layer was known as the kilohana, it was colored and decorated with pigments; the collective name for the inner kapa sheets was ‘iho.’ (Brigham) The loose-leaf design allowed the user to choose how many layers needed on a given night. 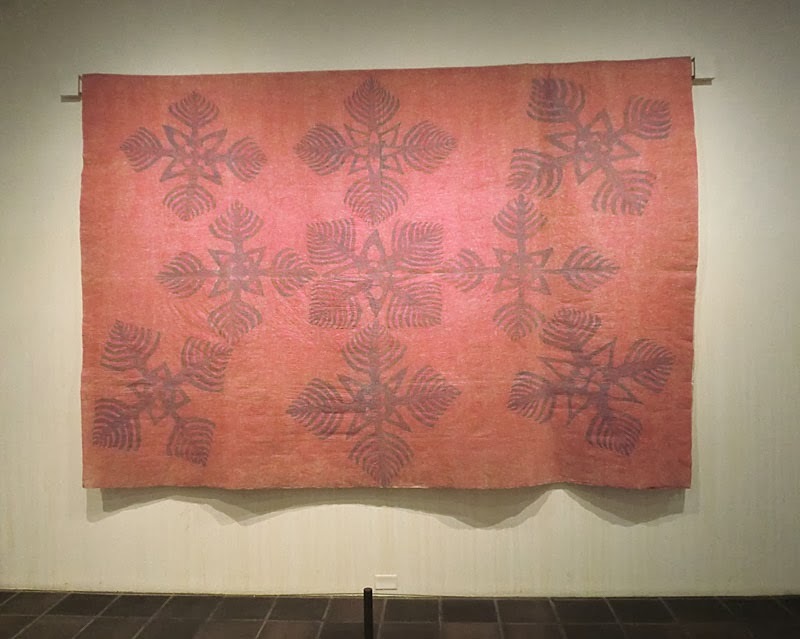 A notable kapa moe belonging to Princess Kaʻiulani was installed at the Art of the Pacific gallery at the Los Angeles County Museum of Art (not currently on public view.) it is described as an unusually large five-layer kapa moe. Kapa moe were gradually replaced by blankets. Later, another bed cover, the Hawaiian quilt, came into regular use. Here HERE for a prior summary on the Hawaiian quilt. The wives of American missionaries introduced the patchwork quilts and their construction to Hawaiians. The first missionary women arrived in 1820, and were warmly welcomed by some of the highest-ranking Hawaiian men and women. 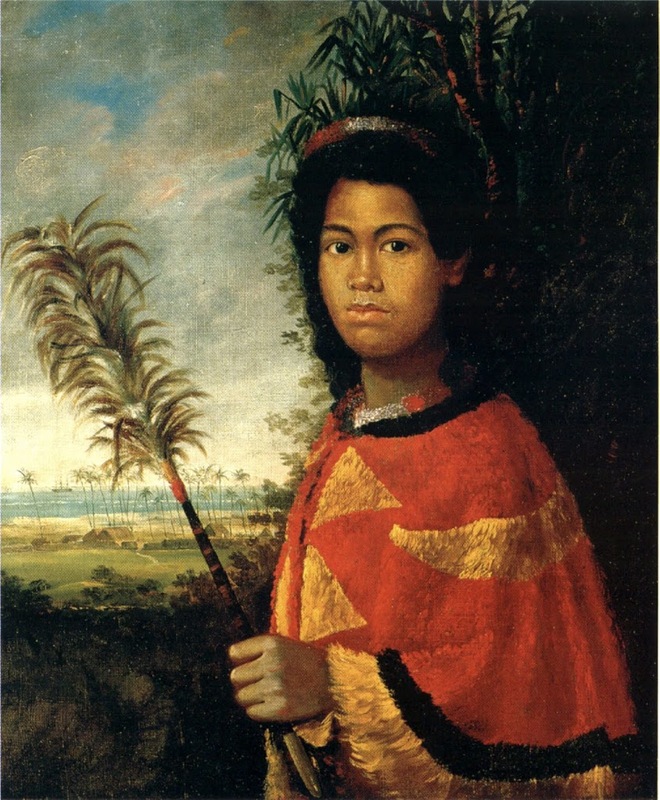 The image shows Princess Kaʻiulani’s kapa moe. In addition, I have added other related images in a folder of like name in the Photos section on my Facebook and Google+ pages. Throughout the years of late-prehistory, 1400s – 1700s AD, and through much of the 1800s, the canoe was a principal means of travel in ancient Hawai`i. Most permanent villages initially were near the ocean and sheltered beaches, which provided access to good fishing grounds, as well as facilitating canoe travel between villages. Although the canoe was a principal means of travel in ancient Hawaiʻi, extensive cross-country trail networks. Overland travel was by foot and followed the traditional trails. Then, in 1803, American ship under Captain William Shaler (with commercial officer Richard Cleveland,) arrived with three horses aboard – gifts for King Kamehameha. So, how did the women adapt to the horse transportation environment? In pre-contact Hawaii, the predominant form of dress for women was the pāʻū. 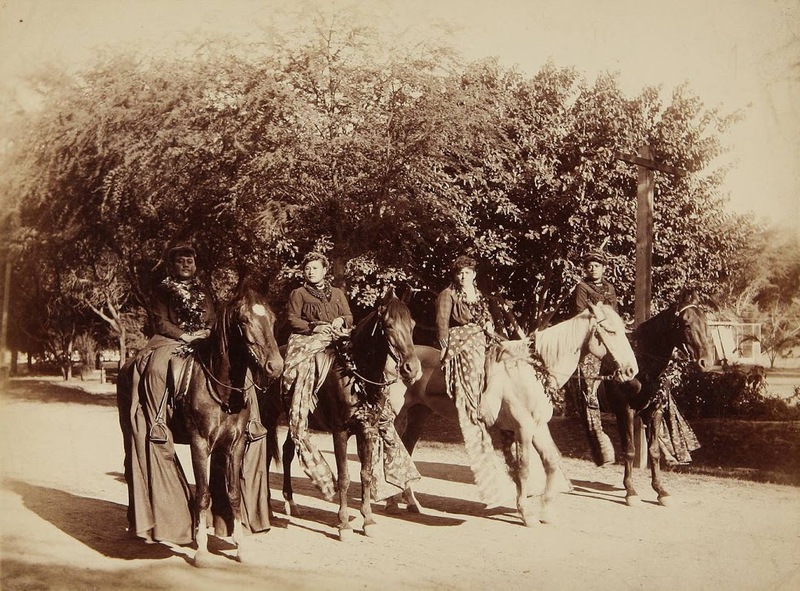 By the time of horse travel, Hawaiian fashion had already transitioned to Western wear, and Hawaiian women chose to ride astride, rather than sidesaddle. They adapted the traditional pāʻū by adding length to it – it was worn as a protective covering to keep a woman’s fancy garment from getting soiled on the way to a party or gathering. The earliest pāʻū skirts were formed from fabrics of the day, primarily calico or gingham. It was made of a single piece of fabric, up to 12 yards in length, wrapped around the rider in such a way as to flow over the stirrups and to the ground. There are no “fasteners,” such as buttons, pins or buckles; the pāʻū is held in place with kukui nuts that are twisted inside the fabric, tucked into the waistband for a secure fit. There are different methods for wrapping, depending on family tradition. Some start from front to back and use just a few kukui nuts to hold the skirt in place, while others gather the fabric from the back, using up to eight kukui nuts. By the early-1900s, the automobile made its appearance and soon reduced the need and use of horses. Then, a group of women made a society to keep the culture going and Pāʻū clubs were formed. Pāʻū riding is a uniquely Hawaiian equestrian style; one notable horsewoman, Anna Lindsey Perry-Fiske introduced the continent to the riding tradition at the Calgary Stampede and the 1972 Pasadena Tournament of Roses Parade. She later show-cased “Old Hawaiʻi on Horseback” pageants. The tradition of wearing the pāʻū is kept alive today and has evolved into an elaborate display in which lei-adorned women demonstrate their horsemanship at parades and celebrations throughout Hawaiʻi. With the pāʻū queen and her unit leading the way, each pāʻū princess presides over her own unit representing one of the eight major Hawaiian Islands, with each island unit displaying its island flower and colors. Niʻihau has niʻihau shells and their colors are brown/white; Kauaʻi has the mokihana and their color is purple; Oahu has an Ilima flower and their color is yellow; Molokaʻi has kukui and their color is green; Maui has the lokelani and their color is pink; Lānaʻi has the kaunaona and their color is orange; Kahoolawe has ahinahina and their colors are grey/blue and Hawaiʻi Island has the ʻōhiʻa lehua and their color is red. The Merrie Monarch Royal Parade is held today at 10:30 am, the Pāʻū riders will be there; the parade begins and ends at Pauahi St. and winds through downtown Hilo (Kilauea Ave. – Keawe St. – Waiānuenue Ave. – Kamehameha Ave.) The image shows four pāʻū riders in the 1880s. In addition, I have added other images to a folder of like name in the Photos section on my Facebook and Google+ pages.